This Hubble picture shows a quasar that has been gravitationally lensed by a galaxy in the foreground, which can be seen as a faint shape around the two bright images of the quasar. The Hubble Space Telescope has directly observed a disk of matter being sucked into a huge black hole. 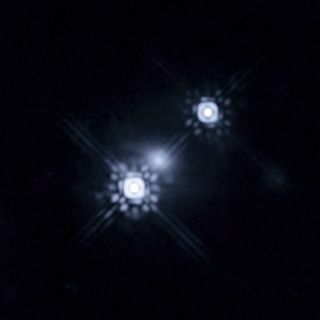 Astronomers capitalized on an effect called gravitational lensing to magnify the image, taking advantage of the warping of light by strong gravity that made the scene visible to Hubble. The high precision of the technique allowed the researchers to measure the size and temperature of the disk. Such disks of matter falling onto extremely large supermassive black holes are called quasars, and are some of the brightest objects in the universe. As their mass is pulled into the black hole, the disks heat up and powerful radiation is released that makes them glow incredibly bright. However, most of these are so far away from us on Earth that astronomers have a very hard time directly observing their structure. Luckily, this quasar happened to be directly behind a foreground galaxy, from our line of sight, whose stars' gravity acted like a lens to magnify the light coming from the quasar. This allowed the astronomers to glimpse details of the quasars that would otherwise be much too small to see. The researchers observed small changes in color across the length of the quasar disk that correspond to different temperatures, proving new levels of detail about one of nature's most bizarre and powerful phenomena. "This result is very relevant because it implies we are now able to obtain observational data on the structure of these systems, rather than relying on theory alone," Muñoz said. "Quasars' physical properties are not yet well understood. This new ability to obtain observational measurements is therefore opening a new window to help understand the nature of these objects." The astronomers also calculated that the quasar is between four and eleven light-days across (approximately 62 billion to 190 billion miles, or 100 billion to 300 billion kilometers). A light day is the distance light travels in a day. The findings are reported in the December 1 issue of the Astrophysical Journal.